After thirty minutes, a female consulate employee came to help me. She gave me papers to fill out and told me to come back in an hour. I was not allowed to stay there while I did this. Back to the front office. I tried to get across to them that I wanted to go get coffee. I learned that there is only one word recognized worldwide: Starbucks! I didn't find Starbucks, but did find a cute neuvo chic cafe. I knew it was neuvo chic because the two-inch by two-inch pie de lemon was $4. I didn't bother to calculate the latte. Back at the window an hour later, Mr. Haiti was still there. He was now arguing about his social security card. He was telling the woman that, yes, he had a social security card. It is blue and red with a bunch of numbers on it, but he doesn't have the card and doesn't know the numbers and besides that, his numbers are none of her business. Meanwhile his wife tried to cope with a very fussy baby. She had fed him earlier but now she held him like he was going to break. I went to her and gestured that I wanted to hold him. After about four or five good pats on the back he gave out a burp that would make any couch potato proud. The fussing stopped. I took my papers to another counter where the clerk said it would be another hour, but I could wait there. Another American woman showed up and told me no one told her that she couldn't travel through South America with a passport card. I don't know how she got into the country in the first place. At last I was handed my replacement passport. Mr. Haiti was still at the counter, the woman with only a passport card was being interviewed by the police, and the young Australian had no clue if he was going to get a new passport. Antonio, the Grand Circle representative who had picked me up at the airport, had given me his card and said to call his cell when I was done. You may not believe this, but trust me it's true: There is no phone in the consulate that can dial a cell phone number. Finally I got someone to lend me their cell and I walked out of there with a smile on my face. Lesson learned—never lose your passport! 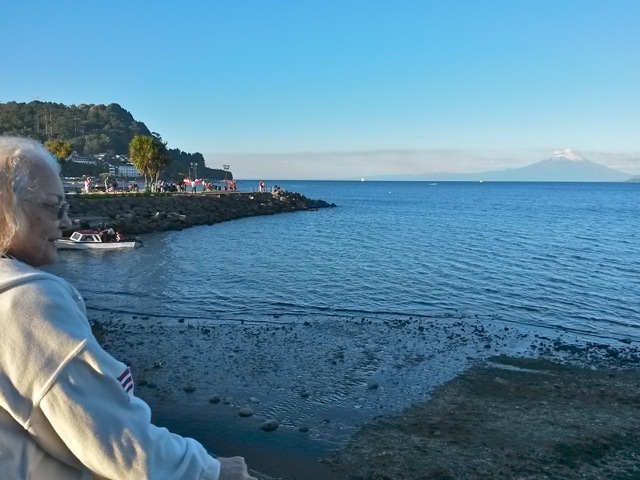 At Lake Llanguihue in Puerto Varas, Joyce says good-bye to Volcan Osorno, before returning to Santiago to report her lost passport at the US Consulate. One other interesting, or rather sad, thing. A new GCT group had arrived at the Crowne Plaza and there was a couple on the computer who forgotten the paperwork to get into Argentina. My heart went out to them. So my trip back to Las Vegas was, albeit long, an easy one. Grand Circle was on top of everything. I enjoyed a good day and a half in Santiago. I took the fenicular to the zoo and saw animals I don't remember ever seeing before. I went to the sandwich shop near the hotel, which provided lunch for two days. That first night I went to sleep watching reruns of Pawn Stars, the only thing on cable television in English. EDITOR AFTERWORD: Joyce was not allowed to travel outside of Chile on her replacement US passport, so she was unable to rejoin the tour and continue on to Buenos Aires, Argentine and Iguassu Falls, Brazil. The replacement passport only allowed her to fly back to the United States, where she must file a lost passport claim and wait to receive a new official passport. Joyce Marshall Moore, a seasoned traveler, has made over twenty trips with Grand Circle Tours. An archivist who is retired from the Special Collections department at the University of Nevada, Las Vegas, Joyce has lived her entire life in Las Vegas, Nevada.